Originally issued in 2015 on the always dependable CD format for dark ambient music, interestingly it is a musical style which does not regularly get the vinyl treatment. This is in some ways understandable given the digital formal of the CD suits the tonal range and subtler aspects of dark ambience, but not that this should preclude vinyl pressings altogether. 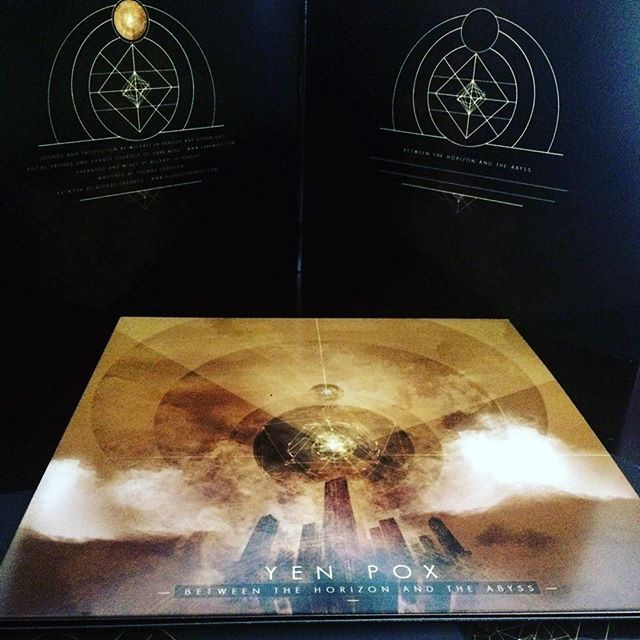 Yet sometimes a dark ambient album comes along which is a clear milestone and specifically commands a vinyl pressing: such as Yen Pox’s latest epic ‘Beyond The Horizon And The Abyss’. With its complex, expansive and enveloping style, its pressing on pristine vinyl sounds simply amazing. Equally the artwork of the CD version also very much warrants the larger format of a gatefold LP and looks stunning here, having been issued in an edition of 250 copies in either black or yellow. In passing this is a veritable modern classic of the genre, so don’t miss it if vinyl is your medium of choice. Full noise receptor journal review here. This entry was posted in 2016, Burning Inside Records, dark ambient, Malignant Records by noisereceptor. Bookmark the permalink.